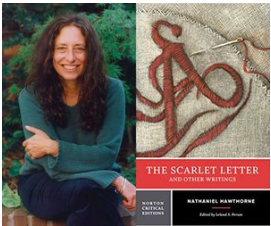 Nathaniel Hawthorne’s The Scarlet Letter, with Carol Gilligan. Nathaniel Hawthorne‘s 1850 novel The Scarlet Letter tells the dramatic story of a woman cast out of society for adultery and condemned to wear a badge of shame in Puritan New England. Renowned psychologist Carol Gilligan identifies Hawthorne’s masterpiece as “the American novel” because (as Hawthorne puts it toward the book’s end) it points to a “new truth [that would place] the whole relation between man and woman on a surer ground of mutual happiness.” Gilligan revolutionized our understanding of human development by listening to girls, and showing, in her landmark study, In A Different Voice: Psychological Theory and Human Development, how a “different voice” reveals something about our humanity that is more truthful, more authentic, and more generative for our lives together than the voice that privileges autonomy, identity and separation as moral ideals. Gilligan is the author of many other books, including a novel and the recent Why Does the Patriarchy Persist, and (with David Richards), Darkness Now Visible: Patriarchy’s Resurgence and Feminist Resistance. She explains how The Scarlet Letter is not only about the wages of sin and tragic love, but also about a vision of democracy that we have yet to realize fully, and about the way feminism is the key to achieving our democracy as it is threatened by the persistence of the patriarchy. Gilligan’s reading lifts Hawthorne’s book above its status as required reading, often assigned as a lesson in morality or a book about the long-gone past, by showing how The Scarlet Letter presents a vision of authentic love and a path to true democracy where equality and justice will be attained.